Spread the holiday cheer among your biker friends this season with these Free Printable Motorcycle Christmas Gift Tags featuring two holiday greetings and a chopper motorcycle. These tags are perfect for attaching to just about any kind of gift including food gifts, beer or wine gifts, white elephant gifts, handmade gifts or gifts handpicked from your favorite motorcycle store. These motorcycle Christmas gift tags were designed especially for Motorcycle Everything by Glitter 'N' Spice and you can find more of her printable designs featured in her Etsy Shop. This item is strictly for your PERSONAL USE and cannot be reproduced or distributed without my permission. NO file sharing, reselling, commercial use, mass production or modifying files. You MAY NOT RESELL as a digital or a printed product. If you wish to share these printables with others, please share the link to this page so they can download their own copy. If you are a blogger and would like to feature this post in a roundup, you are welcome to use one image linking back to this page. No altering or removing watermarks is permitted. The printables are sized for printing on 8.5 x 11 inch WHITE cardstock. You need Adobe Reader or a different PDF reader installed to open and print the PDF files. To print these printables at full size, UNCHECK the "scale to fit to media" box in your printer settings. 'Tis the season to park your bike and dream of greener days to come! In the meantime, why not embrace the winter season and celebrate the holidays biker style. These free printable motorcycle Christmas gift tags are just what is needed to brush off the off-season riding blues! These free motorcycle chalkboard gift tags include two holiday sentiments; Season's Greetings and Merry Christmas. The tags each measure 2.5" x 3.5" and are formatted (8) per 8.5" x 11" sheet, 4 tags each per sentiment. These ultra cool biker gift tags feature a white chopper motorcycle with white text against a black chalkboard background. The tags use black ink to print and must be printed on WHITE cardstock or paper. Print them out using a home printer or a printing service, and then cut them out and punch a hole in the top using a hole punch. If your biker friends and family are too cool for traditional gift tags, and you are looking to add a little sass and badass to your holiday gift giving, then these motorcycle gift tags are perfect for you! Happy holidays! You Will Receive Exclusive Access To The Clubhouse, Our Members Only Area, Where You Can Download Any Or All Of Our Free Motorcycle Themed Printables. In addition, you will receive a weekly newsletter featuring awesome products and tips for motorcyclists that we highlight on our Motorcycle Everything blog. Lots of exciting posts to come! Sign Me Up And Send Me The Secret Password To Download My Freebie! Already a subscriber? Go to the Clubhouse and enter your password. You can find your password in the welcome email sent to you when you signed up. The Tags Can be Personalized Too!! 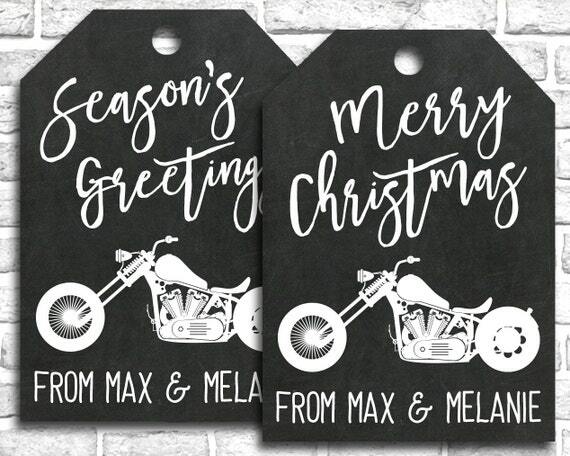 For a small fee, you can have these motorcycle holiday gift tags personalized for you by MyPrintablePartyShop on Etsy. They are super easy to order! Choose either Season's Greetings or Merry Christmas from the dropdown menu, select your file preference, either PDF or JPEG, and checkout. In the notes to seller box, add the name or names you would like on the bottom of the motorcycle tags. The shop owner will personalize the gift tags for you and send you a Dropbox link with your print ready file within 24 hours. Just open up the Dropbox link, download and print! All designs/creations are copyrighted 2016 © MyPrintablePartyShop All Rights Reserved. Subscribe to our weekly newsletter for the latest news and to receive exclusive access to our free motorcycle printables.